Pam Leppin is ASHA's Advertising Sales Director. She is an avid cook and she produced and sells a really nice herb chart. When I started thinking about spicing up our meals during the challenge, I went straight to Pam and asked her to write a post for us. Pam has her own blog Artistic Feast. My husband and I got married on Pink Gin Beach in Grenada, the Island of Spice. The island is one of the largest producers of nutmeg in the world. 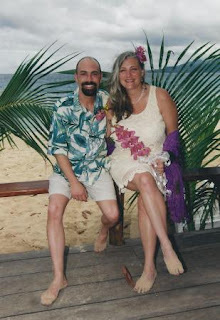 We had three glorious days to explore this beautiful island while we obtained residency so we could get married there. During our fun-filled days, we visited a nutmeg plantation. We discovered that all parts of the nutmeg are used in cooking. The fruit surrounding the nut, nutmeg apple, is used to make jams and syrup. 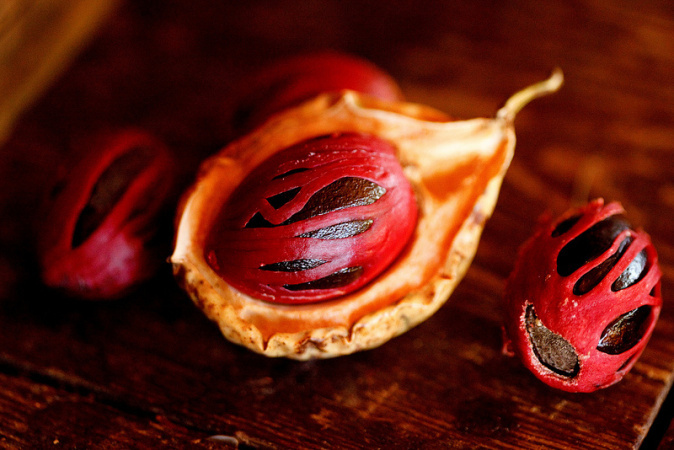 The nut shell is wrapped in red tendril fingers of the spice Mace and inside the shell is the nutmeg meat itself. The layers of nutmeg. Photo by Joshua Yetman. raisins, squash, and of course, pumpkin. A word of warning…nutmeg should be used in moderation. It has a strong flavor that can overwhelm your dish and ingesting large quantities can be a health hazard causing hallucinations and even death. You’re not likely to overdose on nutmeg. You’d have to eat one or more whole nuts and by then your food would be so overwhelmed with flavor you probably wouldn’t want to eat it anyway. 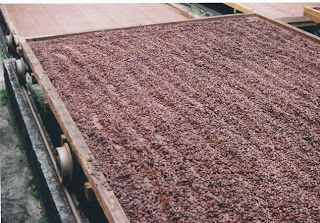 Nutmeg drying. Photo by Pam Leppin. Speaking of whole nuts, you should always use fresh, whole nutmeg, rather than pre-ground. It only requires a little bit of extra effort and the flavor difference is enormous. Roll the nutmeg with the palm of your hand on the counter top, cracking the hard outer shell and swipe the nut inside across on a mini grater a few times on top of your eggs instead of salt. Amazing. I don't want to have to count calories or follow a point plan to lose weight. I believe the Mediterranean Lifestyle Challenge is presenting me with the solution I've been seeking. I love that it is about mindful eating, breaking the sugar addiction, and sharing meals with those you love. I'm an avid cook and I love feeding people. Nothing gives me quite the same pleasure as filling my home with friends and family, sharing a bottle of wine (or two) and watching them devourer what I have lovingly made for them. It fills my heart with immense joy. Long before visiting the Island of Spice, I was a big fan of using herbs and spices. I’ve had an herb garden, of one sort or another, at every house I’ve lived in since I was 10. Herbs and spices can add a complex depth of flavor without adding extra salt and butter. It is all in the layering. So many herbs complement one another. Most folks know from classic Italian cuisine that garlic, basil, and oregano blend well together with tomato, but did you know that basil and dill are a wonderful combination as well? Both herbs taste great with one another on carrots, yellow squash, eggs, shellfish, lamb, and cucumber. Years ago I was searching for a resource that would easily tell me what herbs tasted good with what food and with what other herbs I could combo together to add depth. I could find a variety of resources to tell me one or the other but not both. 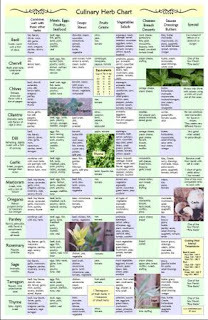 So I researched, experimented, ate and ultimately developed a culinary herb chart that would give me a cross reference at a glance. The result hangs inside my spice cabinet door and gets used on a regular basis. The chart covers 13 different herbs, cross referencing which herbs work with each other, and with what foods. If you work at ASHA, you can stop by my desk and pick one up for $10 or visit my website/blog and have one shipped to you for a little bit more. While you're there, check out my blog post on making preserved lemons and chimichurri. Here are some handy online resources for using culinary herbs and spices including The Epicentre's encyclopedia of spices, Spice Advice's online chart, About.com's herb and spice chart, and Epicurious' visual guide to fresh herbs. Dried herbs have a more intense flavor than fresh. So if a recipe calls for dried herbs and you're using fresh, use more. A good rule of thumb for every 1t dried = 1T fresh. Some herbs and spices are strong and can overwhelm a dish. A number of these are sage, cumin, nutmeg, rosemary, cardamon, cloves, allspice, and cinnamon. They should be used in moderation. Don't discount parsley and relegate it to being only a garnish. Parsley combines well with most herbs and foods, as it adds flavor and depth to your dish. Fresh parsley can brighten heavy dishes. It is a must for bouquet garni when making stock or soup. To create your bouquet garni, tie together a bundle of fresh herbs with cotton twine or wrap dried/fresh herbs in cheesecloth and drop into your pot. Most bundles include parsley, bay leaves, thyme, but can also include rosemary, tarragon, chervil, savory, and peppercorns depending on what you're making. Remove the bundle before serving. Heat and spices don't get along. If you store your spices over the stove, oven, or dishwasher the rising heat makes them lose their flavor and potency rapidly. Pick a spot away from heat sources and moisture. Store them in air tight containers. Go through your spice cabinet and replace the bottles that have been lingering. The bottle of paprika that you bought for a recipe five years ago, has probably gone over and won't taste like it should. McCormick has some great information on the recommended shelf life including a Fresh Tester tool that allows you to put in the code from the bottom of your McCormick spice bottle and will tell you the age of that spice. Ground spices usually last 2-3 years with dried herbs having a shorter shelf life at 1-3 years. If you think it has been around too long, dump the spice and keep the bottle. Many spices travel great distances, from far away exotic places, and can be quite costly. Ever looked at the price per pound when buying the little bottles in the grocery store? Marjoram is $255/lb, bay leaves are a whopping $834/lb. Ouch! Find your local natural market, many like the Common Market in Frederick, that sells bulk herbs and spices at a much cheaper price per pound and you can buy as much or as little as you need. I buy a big bag of marjoram, as it tastes wonderful on most vegetables. A little bottle of marjoram in the grocery store will set me back $6.19 but I can buy in bulk, refill an old, well-washed, spice bottle for pennies comparatively. Want fresh herbs? Try your hand at growing them yourself. Many herbs are like weeds, they will grow in the worst of soils, as long as they have plenty of sun and water. So pick a sunny spot and give it whirl. There is nothing quite like running your hand over a rosemary bush and then putting your palm to your face and inhaling. The rich earthly scent fills your nose and according to research, can improve your memory and mood, as well as flavor your dinner. Health Diaries' Eat this! notes 16 health benefits of this wonderful Mediterranean herb. I’m not going to delve too deeply into the health benefits of herbs, although there are many and much research to support the benefits. Check out the Huffington Post article on the 25 healthy herbs. ASHA's health care provider, United Healthcare has an article on the healing powers of a handful of herbs as well. On a personal note, I use turmeric to reduce inflammation. To find more information on the benefits of turmeric, try looking at Dr. Weil's website. In an effort to not turn everything I cook bright yellow, I take a 1,000 mg capsule of turmeric every day. If I don't take it for a couple days, I notice a big difference in how my knee joints feel. Being overweight can increase inflammation throughout your body...another good reason to drop the extra pounds and to add turmeric to your diet. Want to learn more about using herbs and spices in your cooking adventures? Check out this blog post. It has some great information. My husband was and still can be a rather picky eater. When we first met, the only salad green he would consume was iceberg lettuce. On the same weddingmoon trip to the Grenadines, we were having lunch on a secluded beach. They served us shrimp salad on a bed of baby spinach leaves with a mango dressing. After inhaling the entire plate full of food, he asked "what were those green leaves?" I laughed out loud. I’m happy to report that he now eats a wide variety of greens. His mom is amazed at what he'll eat nowadays. I’m still trying to recreate the mango dressing. Now that I think about it, I bet there was nutmeg in it…shrimp, mango, spinach…all yummy with nutmeg. Hmmm, perhaps that has been the missing ingredient all along. Differentiating between herbs and spices would be difficult, but there are many herbs that are useful to us in many ways. Herbs have the quality and properties to serve many of the health related problems. Thanks for suggesting about this.